HomeTyrannyFrance’s New Labor Laws: Casualization as a Social Model in France? Definitely Not! 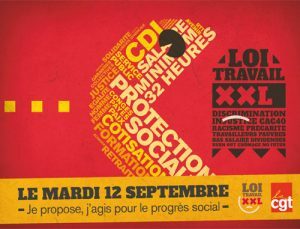 On August 31st, the French government finally published decrees which alter labour law, for the second time in little over a year. Less rights for workers, more power for employers: that is, in a nutshell, the content of this new law. This further social retrenchment goes much further than the previous reform (so-called “El-Khomri Law”), although the El-Khomri Law was explicitly condemned by the United Nations as contrary to France’s international commitments, and against which a complaint has been lodged with the International Labour Organization. Drastic reduction of severance pay for unfair dismissal. In cases of questioning dismissals with the relevant jurisdictions, the decrees provide for capped compensation. This means that employers will know in advance how much it will cost them when they violate the law through unfair dismissals! The bigger the firms and the greater their financial means, the easier it will be to include provisions in their budgets, so as to be able to organize dismissals without any real or serious grounds. Depreciation of the role of unions in firm-level bargaining. It will now be possible for bargaining to take place in small firms through referendum, without staff or union representatives. In other firms, the rules differ according to size, but globally, the result remains the same: any firm’s management can convene a referendum unilaterally. Such a referendum is therefore a major tool against workers, to impose an agreement that would be rejected by majority unions. Merger of the current three workers’ representative bodies into a single entity, “the Social and Economic Committee.” This reorganization will mean more remote representatives, as they will have to deal with affairs at higher levels, thus spending less time spent with workers facing difficulties at the workplace. The government is quite obviously trying to restrain any opposition, thus curtailing social democracy in our country. The El-Khomri Law turned upside down the standards that regulate labour law. The new reform is a follow-up to, and an amplification of, that previous law. Thus, in most areas (bonuses, allowances, maternity leave…), company agreements will take precedence over branch agreement, even if they are less favourable to workers. For instance, a company agreement may provide for less bonuses or longer working time. If workers refuse changes to their contract of employment, they will automatically be laid-off on “compelling grounds.” Employers might be tempted to use this kind of blackmail to avoid any opposition. Ultimately, the purpose is for employers to be able to negotiate the retrenchments that suit them best. In France, over 50% of workers are employed in small or very small firms – with weak union representation – but they come under branch collective agreements. With the reform, workers will be faced with possible company agreements that are below branch agreements. Image within the text body is from the author.